I enjoyed this film very much. The reason I wanted to watch Polly is that its a musical, and anyone that knows me know I love musicals! 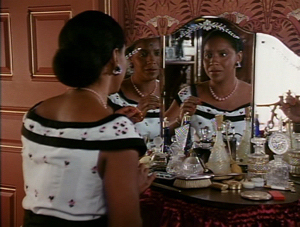 I can't remember ever watching a musical period film with a majority black cast. I don't have anything bad to say about the film. Everything was in order. 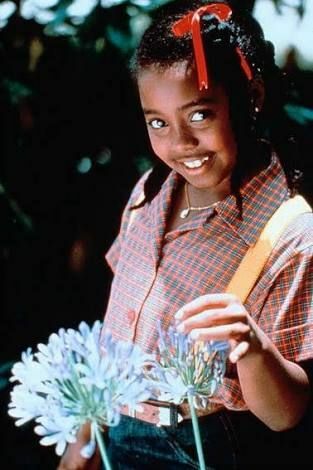 Keshia Knight Pulliam is adorable. The acting from the whole cast is spot on. The musical numbers are brilliant and the costumes are beautiful. As this is a Debbie Allen and Phylicia Rashad production, I expected nothing less. Because everything is in such great order I'll be posting specific things I loved about Polly in place of one mega review post. I will however do a quick post of my overall thoughts. Polly is inspired by the novel Pollyanna, there is also a film based on the novel. But as I have neither watched nor read these productions I am judging Polly on its own merits as a film. Pulliam as Polly is amazing. From the very start we care about Polly. She is a smart and talkative little girl but she never comes off as disrespectful or annoying. Rashad as Aunt Polly is golden. I have never seen her in a more nasty role! I think we're all so use to seeing her as Mama Cosby. Seeing her as an embittered woman was a different thing. But she carried it off brilliantly. The romance between her and Dr. Shannon is great. I'll be doing a separate post on their story line. I was absolutely inspired by the costumes. They will also be getting their own post! To wrap it all up, Polly is an incredibly moving tale on love, forgiveness, and racial acceptance. I recommend it highly.